Some dog breeds are better-suited to be working dogs than others – that much you probably know already. But which breeds are the best for working roles? And which dogs are suited to which types of jobs? If you are going to pick out the perfect dog to train for a specific task, you need to be sure that you are selecting from a breed that is inclined to handle the job at hand. Below we have assembled a list of some of the most-popular and most-successful working dog breeds. To start our list, we are going to take a look at the Akita, which is a large breed from Japan. Although this is a dog that originated in Japan, there is an American strain which is typically thought of as its own breed. Males within the American breed of the Akita often weigh anywhere from 100 – 130 pounds, while females are typically between 70 and 100 pounds. There are a number of different tasks which can be completed by the Akita, however it is typically used in modern times as simply a companion or therapy dog. However, the Akita is capable of pulling and hunting, assuming that the dog has been trained properly from a young age. When you are looking for a dog that is both strong and beautiful, the Alaskan Malamute is certainly one that should be high on the list. These dogs are great at pulling heavy weights over long distances, which is why they have been used as sled dogs. The physical traits of this dog can best be described as a combination of power and endurance, which stands in contrast to a Siberian Husky, which is bred with a focus on speed instead. There is a range of sizes possible within this breed, however females usually weigh around 75 pounds with males coming in at about 85 pounds. As mentioned, this breed has been used as sled dogs either for work or for pleasure, although the majority today are companion dogs. A member of the Working Group of dogs, the Bernese Mountain Dog has a long history of reliable service to its owners. Male dogs of this breed can weigh between 80 and 120 pounds, with females weighing 70-110 pounds. As a mountain dog which is a member of the four breeds of Sennenhund, Bernese Mountain Dogs are very adept at traditional farming tasks, as well as pulling. These are strong dogs, and most of them enjoy getting regular exercise and feel most comfortable when they are outside. The Black Russian Terrier is a breed of dog which was specifically developed to serve as a working dog many decades ago. Although the name of the breed includes the word ‘terrier’, this breed is not actually considered to be a true terrier, as it was bred from a variety of different dog breeds. These are large dogs, with males weighing between 110 – 130 pounds. With ample size and a generally calm demeanor, this dog is well-suited for a variety of tasks including pulling, guarding, companionship, and more. Smaller than many of the other breeds on our list, boxers are usually between 55-70 pounds for males and females alike. This is another member of the Working Group, with this specific breed having been developed in Germany. Often used as guard dogs thanks to their general alertness, boxers can also be used in a number of other roles including as guide dogs, therapy dogs, police dogs, and even herding dogs. This is one of the most-flexible and versatile breeds in the working dog world, so training a boxer leaves the door open for many potential forms of service. Some working dogs can be difficult to train from the puppy stage, and that is often the case with the Cane Corso. A powerful and large dog when fully grown, this can be a difficult breed to control in its early years. A grown Cane Corso will typically weigh more than 100 pounds, and can serve a variety of working roles including as a hunting dog, a guard dog, and a companion. In addition to the name Cane Corso, this breed is also known as the Italian Mastiff. When you think about a working dog that has been tasked with the job of serving as a guard dog, you probably think first about a Doberman Pinscher. These large dogs were developed in Germany more than a century ago, with adult males weighing in the range of 90 – 100 pounds (females weigh slightly less). If properly trained, a Doberman can be a loyal servant, eager to please its owner. These dogs tend to have a powerful bite, which is one of the main reasons for their longstanding popularity as guard dogs and protectors. In addition to that bite, the intelligence of this dog plays an important role in its ability to work. Drawn from the same origins as a Doberman Pinscher, the German Pinscher is smaller than the Doberman, with the average grown male weighing just 25 – 45 pounds. The appearance of the German Pinscher is remarkably similar to the Doberman however, with many of the same characteristics. Due to their smaller size, this breed is not as well-suited to serving as a guard dog, although it could serve in that capacity when provided with the right training. The Giant Schnauzer is a breed that has served many roles over its long history, which dates back into the 17th century. Among the many jobs that this breed has been able to handle includes guard dog, police dog, herding dog, and more. A full-grown adult Giant Schnauzer frequently will weigh between 75 – 100 pounds, and males are usually slightly taller than females. These dogs are known for being territorial at times, and they are quiet by nature. In addition to their size and temperament, it is their intelligence that is often cited as one of the reasons they can be used effectively as working dogs. One of the most-recognized breeds in the world, the Great Dane is among the largest dog breeds in existence today. Adult male Great Danes weigh a minimum of 120 pounds, and they are also one of the tallest breeds to go along with their weight. Many people get the wrong impression of these dogs due to their imposing size, as they are actually a rather friendly, docile breed which seeks out physical affection. While capable of serving in some working functions, most Great Danes are kept either simply as companion dogs, or as show dogs to perform in competition. A breed of dogs that is in the same classification as the Newfoundland and the St. Bernard, the Great Pyrenees is not as popular as it once was, yet remains desirable due to a number of traits. One of the largest dog breeds, adult Great Pyrenees will weigh anywhere between 85 – 140 pounds. Usually gentle in temperament, the Great Pyrenees can serve as a reliable guard dog simply due to size alone. Great Pyrenees have long been used to guard livestock, and they are still deployed in that type of service in many locations today. The name of this breed alone tells you the story of its history. Developed in the beautiful Swiss Alps, the Greater Swiss Mountain Dog is an extremely large breed, with adult males weighing from 130 – 155 pounds. Originally a farm dog, this breed has impressive strength to go along with its size, and yet it remains agile at the same time. With a temperament that is both active and calm, a well-trained Greater Swiss Mountain Dog is able to handle many farm duties consistent with its history and tradition. Rather than just one specific breed, the term Mastiff refers to any number of large molosser dogs. These are generally among the biggest dogs in the world, and they are typically well-built with a muscular frame and plenty of power. Among the many dogs that fall into the Mastiff category includes the Bullmastiff, the American Mastiff, the English Mastiff, and many more. 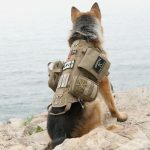 These are often considered to be excellent working dogs due to their size and strength, however their capabilities to perform specific tasks depend largely on the specific breed and the training provided. Unlike most large working dogs, who do their best work on land, Newfoundland dogs are actually quite adept at working in the water. Natural swimmers, this Canadian breed is one of the biggest in the world, with males weighing between 140 – 175 pounds. One of the best ways in which Newfoundland dogs can serve in a working capacity is by rescuing people from the water. This breed has long been used by sailors for their life saving ability, and the dogs continue to serve in that role to this day. Obviously this skill does not necessarily translate to land-based working tasks, but a Newfoundland is going to be an easy choice when it is water rescue that is required. As the name would indicate, this next breed on our list is another which is well-suited to handling tasks in the water. However, unlike the Newfoundland, the Portuguese Water Dog is not overwhelmingly large, with an average adult male weight of between 40 and 60 pounds. This breed enjoys being able to have regular human interaction, and it can be used as a working dog on boats due to its comfort in the water. One of the most-productive working dogs in the world, the Rottweiler breed is capable of filling a variety of different roles. A grown Rottweiler can weigh between 110 – 130 pounds, and they have a lifespan of 8 – 10 years. There are plenty of potential jobs for a Rottweiler to be trained into, including serving as a guide dog, search and rescue dog, guard dog, police dog, and more. Many people associate the Rottweiler breed with aggressive behavior, although that behavior is usually exhibited toward strangers rather than owners. For a Rottweiler to be useful as a working dog and reliable as a companion, they need to be trained properly from an early age. In terms of name-recognition alone, this is one of the best-known dog breeds in the world. The St. Bernard is an extremely large breed, with adults weighing from 140 pounds on up to 250 pounds or more. They are known not only for their impressive size, but also for their ability to do important work, such as mountain rescue. For centuries, these dogs have served as farm dogs in the Swiss Alps and surrounding areas. While they are not deployed for alpine rescue in modern times, they do still compete in dog sports and are kept as companion animals. Even if you are not an expert on dog breeds, you can likely recognize the Siberian Husky by just a glance. This working dog has long be associated with pulling sleds in cold conditions in Alaska, Russia, and beyond. These dogs are not as large as many other working dogs in terms of weight – adult males weigh between 45 – 60 pounds – but they are energetic, fit, and powerful. In order to be effective working dogs, Siberian Huskies need to be attentively trained as they can be difficult to control otherwise. As you can see, there are plenty of working dog breeds to pick from as you consider what kind of dog you are going to train for the task you have in mind. Before you pick out the right dog for your needs, make sure to learn more about the various breeds that fit in with your goals. With the right dog and the right training, it is truly amazing what these animals are capable of achieving.